Offer for new members only. Adweek is published by ADWEEK, LLC, 261 Madison Avenue, 8th Floor, New York, NY 10016. 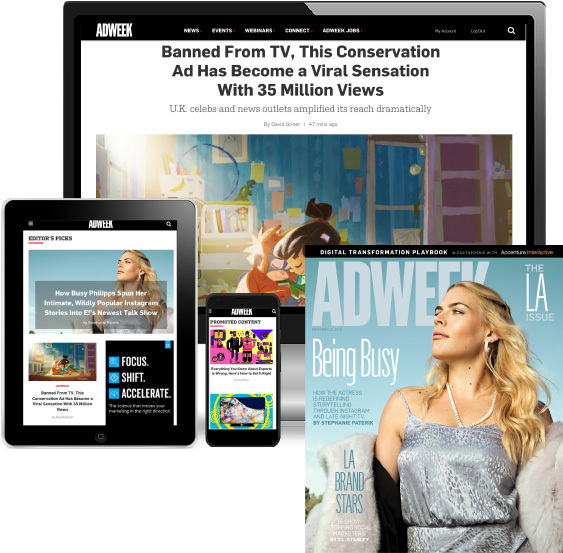 Please allow 2-4 weeks for delivery of your first issue of Adweek.To opt out of receiving the print edition or for other subscription inquiries write or call: ADWEEK, P.O. Box 15, Congers, NY 10920, 1-844-674-8161; outside the U.S. 1-845-267-3007. subscriptions@adweek.com, Please add $5 for Canadian and $10 for International Adweek Pro Digital and Print subscriptions. For FAQs, click here. Adweek Pro corporate membership plans are also available. Click here for more information.